Which Eyebrow Shapes Will Uplift Your Facial Profile to a 10? Are you looking for eyebrow shapes that will complement your face shape? I will give you a quick rundown of different shapes that can lift your look up a few notches…. Here’s how eyebrow shaping works. The 20/80 rule, is that 20% of work produces 80% of the result. Once you’ve got the right brow shape, this changes the entire profile of your face! This change happens with minimal tweaks to your brows. A few hairs here and there, a little filler and brush- and you’re good to go! Start by understanding the effect eyebrow lines. Take a good look at you face shape. Then determine how the lines on it will interact with your other features. Do you want to elongate it or shorten it? Do you want to look stronger, or soften sharp, heavy lines? The brow thickness must co-ordinate with the other parts of your face. Large, prominent features are grounded by thicker brows, and vice versa. For example, if you have a heavy jaw, a big nose, and thick juicy lips, your eyebrows will complement these by being full and deeply colored. If you want to soften your features, make your arch a little more rounded rather than angular. Tiny lips and noses will go better with a thinner brow shape. Not too thin to the point of being pencil like though… Then a bit of filler/ eyebrow pencil will make them stronger. Your natural brows are usually a good starting point for the direction you should go though. So gauge your features and make minimal enhancements to your brows when using this eyebrow shape primer. It’s also important that the eyebrow shapes you go for really frame your eye shape as well. This is because this your eyes and brows really work together in giving you a beautifully groomed face. So meld the information you have about what’s good for your face shape, with the lengths and sizes that optimize your eye shape. If they clash, decide which issue is more important and complementary for you. 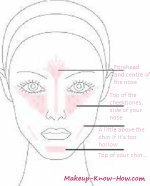 You can also use blush to affect your face shape. The inner ends of the brows will be in line with the ‘dip’ in your nostril. The arch will be in a straight line with the dip and your iris. When determining your arch, remember that a higher arch lengthens the face, and a straighter one shortens. The end of your brow will be in line with the outside of your nostril. After shaping your brows, use eyebrow filler or pencil to fill in gaps and outline the shape. Then take an eyebrow brush and use it to blend the color seamlessly with the brow. For a long face, you want to shorten it and make it a little more centred. This is best done with a flat brow that has a low arch and a short tail. The heart is a mostly a delicate shape. It’s pretty and soft. Thus it’s complemented by a rounded, slightly curved eyebrow. A good eyebrow shape for an oval face is slightly angled. Optimize your brow using the right eyebrow and makeup for your eye shape too. Straight brows will make your face look rounded, while a high arch will make it look longer. So if you'd like to keep the dimensions of your face oval, it's better to strike a balance between the two. A square face has a heavy jaw, and a bulky shape. So the brows have to be thick and slightly rounded or angled to ground the focus on your face and eyes. A round face has a roughly equal length from any one side to the other. So for example, the length from the top of the forehead to the chin is the same as that from inner part of one ear to the other. A higher angled arch makes the face look longer. This then gives the face a slimmer, more oval appearance. 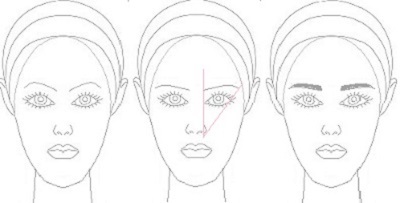 When you've identified your ideal eyebrow shapes, scan through this eyebrow shaping guide for a step by step shaping process.